What’s the 99%, the 1%, and the 53% All About? The OccupyWallStreet movement has helped push the meme of the “99%”. But to what are they referring? And what’s the remaining 1%? The 99% reference refers to income distribution in the U.S. Income distribution is when we line up all the households in order according to their income from lowest to highest. Obviously with somewhere around 150-200 million households in the U.S. we can’t deal with each individually. Instead we group them into percentiles. The 99% refers to the 99% of all households that have the lowest incomes. Obviously this means nearly everybody – 99% of us to be exact. What is not in the 99% is the 1% with the highest household incomes – the really rich. What has the OccupyWallStreet movement so energized and angry though isn’t just the idea that the 99% make less money than the 1%. It’s the idea that the rich, the 1% are getting richer faster than the 99%. In fact, the 99% aren’t really getting richer at all. Instead they (we) have been losing both relative to the rich (the gap is growing) and in absolute terms. Let’s check out a few graphs to illustrate. Incomes grow much, much faster at the top end of the income distribution than in the middle or at the bottom end. 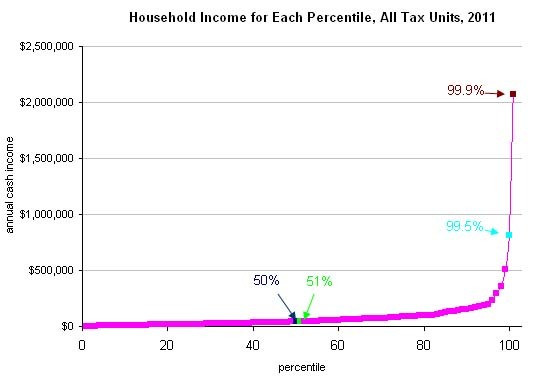 That is, the disparity in income between one percentile and a consecutive percentile is bigger among the very rich. For example, the difference in income between a household at the 50th percentile and a household at the 51st percentile is $1,237 ($42,327 versus $43,564). But the difference in incomes between a household at the 98th percentile and the 99th percentile is $146,118 ($360,435 jumps up to $506,553). The gaps become even wider at the extreme top of the income ladder: A family at the 99.5th percentile makes $815,868; its neighbor at the 99.9th percentile makes more than double that, at $2,075,574 a year. In fact much of the rise in inequality over the last few decades has been because of the increasing inequality isolated among the very top members of the income distribution, as America’s wealthiest have pulled further and further away from their slightly less wealthy peers. This leads us to another similar graphic (graphic from occupydesign.org, but the data is from standard U.S. economic reports). This one reports not income, but wealth (income is what you $ you receive this year, wealth is how much you own). Between June 2009, when the recession officially ended, and June 2011, inflation-adjusted median household income fell 6.7 percent, to $49,909, according to a study by two former Census Bureau officials. During the recession — from December 2007 to June 2009 — household income fell 3.2 percent. So the inflation-adjusted median household income has continued to decline even after the recession ended. In a separate study, Henry S. Farber, an economics professor at Princeton, found that people who lost jobs in the recession and later found work again made an average of 17.5 percent less than they had in their old jobs. Median annual income declined most for households headed by someone with an associate’s degree, dropping 14 percent, to $53,195, in the four-year period that ended in June 2011, the report said. For households headed by people who had not completed high school, median income declined by 7.9 percent, to $25,157. For those with a bachelor’s degree or more, income declined by 6.8 percent, to $82,846. Grim numbers. This is no surprise given the high level of unemployment and underemployment. Essentially, since around 1980 whatever increases in national income (GDP) have occurred have all gone to the top 1% or so of Americans. The rest, the 99% have not enjoyed the growth but they are the ones who worked and produced it. See my post on that here. The inequality in the income distribution in the U.S. is at a highest (most unequal) that it has ever been since the 1920’s and the era of Robber Barons and the Gilded Age. That period didn’t end well resulting in the Great Depression. Finally, when the OccupyWallStreet movement began, some right-wing opponents tried to counter the whole 99% meme. They attempted to create an identification with the moniker “the 53%”. What they were referring to is the fact that of all U.S. households, only 53% pay any U.S. federal income tax after accounting for deductions and tax credits. The implication or suggestion was that the “53%” are the ones who are paying to carry some freeloading 47% of households who supposedly aren’t working and definitely aren’t paying income tax. The problem with this idea is two-fold. First, it’s absolutely not true that 47% of households don’t pay any taxes. They most certainly do pay taxes – a lot of taxes and at nearly the same rates as other households. The 47% just don’t pay federal income tax. They do pay Social Security and Medicare payroll taxes, sales taxes, property taxes, state taxes, and other taxes. Second, a lot of those households don’t pay federal income tax because they are retirees who are living on either tax-exempt pension income or Social Security benefits. Others are simply too low-income despite working to incur federal income tax. A few are very-high income earners in the top 1% who avoid income taxes through deductions and special tax breaks. Solid spread on the economic backbone to the passion of the Occupy movement! Technically speaking, SocSec and Medicare are mandated insurance, not a tax. Does it not bother you that half of America pays next to nothing to pay for any Federal program? Have you not considered that the relative wealth of the U.S. middle class in the post 20 years has been more affected by international influences than the domestic tax structure? Tax every cent in income away from the 1% and the international fundamentals won’t change for the better…but it will create a huge flight of capital to competing countries.